For people with a fear of heights, being on the 70th floor of a skyscraper is nerve-wracking enough. Now imagine riding down a slide at that height with a glass bottom that lets you see the ground 1000 feet below. 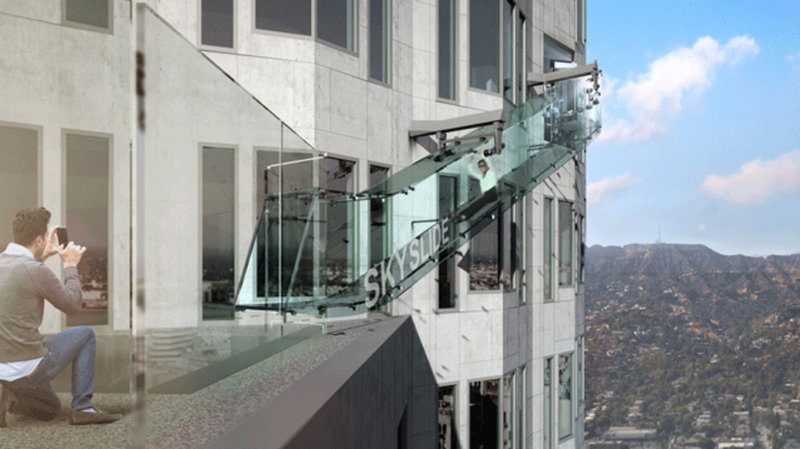 This summer, the U.S. Bank Tower in Los Angeles will officially be home to an enclosed glass slide that snakes along the outside of the building's 70th floor and lands on its 69th, Curbed LA reports. The installation will be part of the tower's fancy new observation deck, which will cost $25 to access. Once you're up there, a ticket to ride the "skyslide" will set you back another $8. There are similar glass-bottomed platforms out there, like the Grand Canyon's Skywalk or Willis Tower's Skydeck (which mental_floss visited in 2014), that give observers the illusion that they're floating hundreds of feet above the ground. The Skyslide offers a unique twist in that it requires thrill-seekers to plummet towards the earth in order to get their stellar views. The slide is set to open with the rest of the building's sky-high complex on June 25.